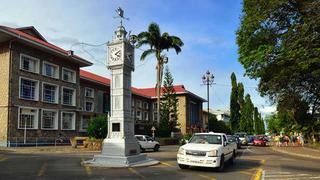 Victoria is located on the largest island in the Seychelles – Mahé and is home to numerous resorts as well as the International airport. Those with the luxury of a yacht at their disposal will usually choose to leave the bustle and head for one of the other 115 islands in search of paradise. Anchoring in the clear waters of St Anne Marine National Park you will start to appreciate the rare natural beauty of the Seychelles, where pink and grey granite boulders have been sculpted by wind and waves into beautiful shapes. Beyond to powder-white beaches, startling green rainforest clings to the rocks and smothers the island. In the morning you might like to dive or snorkel in the clear waters and have your first encounter with the colourful reef fish and corals that thrive here. Sailing towards Praslin, you’ll pass the twin islands of Cousin and Cousine with a beckoning white sand beach – however, like many islands here, one is private and the other a protected park. But even if some islands are largely out-of-bounds there are still plenty of others to explore. 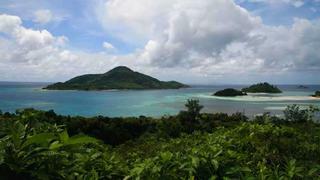 Anchoring in Anse Possession, between Praslin and nearby Curieuse you can once more wonder at the natural beauty here. Taking the tender ashore to a beautiful white sand beach, you’ll find some resorts tastefully hidden within the trees. Before the sun gets too high, take a gentle hike through the rainforest to the Vallée de Mai – home of the famous Coco de Mar tree and a protected World Heritage Site. For many hundreds of years no-one knew the origin of the curiously-shaped nuts that would wash up on beaches in Africa. Their shape – which resembles a naked woman’s hips – even caused some to think that the risqué fruit belonged to the Tree of Knowledge and hence the Seychelles was the site of Eden. Enjoying a sundowner on the beach at one of the luxury resorts later in the day will certainly feel heavenly in any case. This charming little island has a man-made harbour with a modest collection of houses and shops and is populated by friendly people, who use bikes and passenger ox-carts to get around the island (albeit slowly!) The island sustains itself with fragrant vanilla plantations and copra – tourists will certainly enjoy the beaches here. The atolls of the Seychelles are tricky to navigate – they don’t always offer total protection from swell and wind, and some don’t have convenient breaks to allow you to enter the lagoon. But any slight discomfort is more than allayed by the stunning scenery – a picture-perfect, palm fringed isle wrapped within a stunning coral reef in gin-clear water. If conditions allow, this is a good place to make a scuba dive – but if it is a little rolly – don’t worry – the Seychelles are littered with great dive sites. Just a few copra farmers live on Desroches, and there is a modest diving and deep-sea fishing resort, allowing for yet another chance to enjoy a beachside sundowner. Meet your yacht and spend the day on the lagoon. All water activities are possible here. D’Arros has just one house – the rental of which gives you dominion over both islands – great for those seeking utmost privacy. St Joseph is a perfect ocean atoll, with a two-mile wide lagoon studded with coral heads and encircled by sandy islets. It’s a perfect place to enjoy a snorkel or shallow dive among the fish, rays and small sharks. More experienced divers can also enjoy a thrilling wall dive off the atoll’s outer reef. Enjoy a blue water cruise back to Mahé as you reflect on your taste of paradise, then enjoy a little shopping and pampering in an onshore resort before it’s time to head home.